When picking a curriculum to use, we suggest that you utilize resources that are from trusted sources and are consistently updated. FDIC Money Smart – a comprehensive financial education curriculum designed to help low- and moderate-income individuals outside the financial mainstream enhance their financial skills and create positive banking relationships. Federal Reserve System – Financial education resources searchable by grade, topic and more. Your Money, Your Goals – CFPB created a set of financial empowerment materials for organizations that help people meet their financial goals by increasing their knowledge, skills, and resources. Jump$tart Financial Education Clearinghouse – Hundreds of financial curricula for youth, teens, adults and seniors. Money Smart for Young People – The FDIC’s new instructor-led Money Smart for Young People series consists of four free individual grade-level curriculum available for immediate download below. The materials are available for immediate download. Econ Ed at the St. Louis Fed – Our free lesson plans, activities, and readings make it easier for you to teach economics and financial literacy. They offer flexibility and real world connections to help prepare your students with 21st century skills for college and career readiness.We have great resources for consumers and parents, too! Next Gen Personal Finance offers Inquiries in which students will work to answer a big question or experience a big idea. Teacher Notes that accompany each Inquiry to provide guidance, tips, learning objectives and standards alignment as well as supplemental resources that extend the scope of the Inquiry. Comprehension Questions to assess student understanding of the Inquiries. Libraries of: Interactives, Videos, Infographics, Articles, & Supplemental Activities complete with descriptions, suggested questions and tips! Teach Children to Save – Pairs Kansas City metro area K – 3 grade classrooms with community volunteers each April for a 45-minute classroom-ready lesson about the importance of saving. School of Economics – The School of Economics provides high-quality, full-day field trip experiences for elementary school students from the Greater Kansas City area. My Money – find games, fun activities, websites, video games, and information about money for kids and youth. Money Smart for Young People Series Grades 9 – 12 – FDIC uses standards-aligned curriculum series empowers educators with engaging activities to integrate financial education instruction into subjects such as math, English, and social studies. Econ Ed at the St. Louis Fed – Our free lesson plans, activities, and readings make it easier for you to teach economics and financial literacy. They offer flexibility and real world connections to help prepare your students with 21st century skills for college and career readiness. We have great resources for consumers and parents, too! Hands on Banking – Financial information for teens. Money is fun to get and spend. But if you learn some money essentials, you will have more options. Learn money management, how to save, and credit basics. My Money – You will find links to information on how to save money, what to think about when shopping and buying, and how to a budget or a plan so you’ll have enough money when you need it. Money Smart for Adults – FDIC’s instructor-led curriculum consists of eleven training modules that cover basic financial topics. Topics include a description of deposit and credit services offered by financial institutions, choosing and maintaining a checking account, spending plans, the importance of saving, how to obtain and use credit effectively, and the basics of building or repairing credit. Your Money, Your Goals – a set of financial empowerment materials for organizations that help people meet their financial goals by increasing their knowledge, skills, and resources. Whether you’re helping people get a job, find a place to live, or deal with a legal problem, money always comes up. You can use these tools to start the conversation. 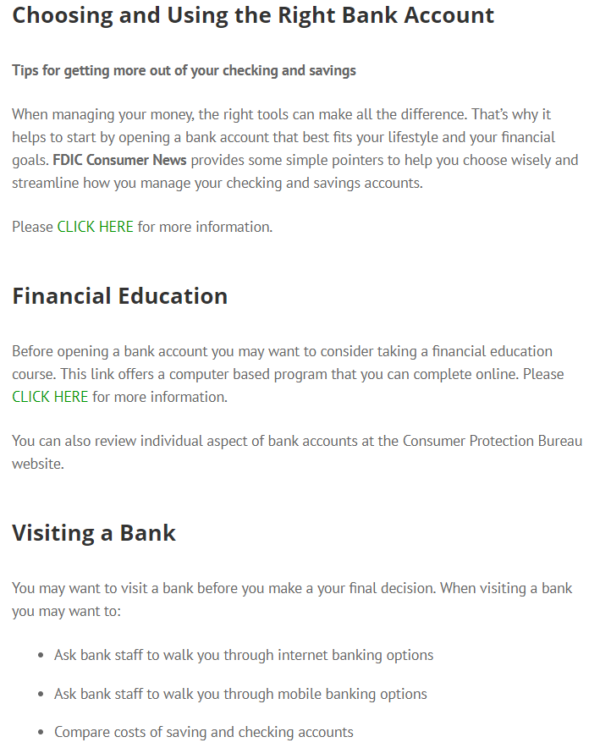 Hands On Banking – Financial information for young adults. Make a strong start in your financial life. Learn about creating a spending plan, starting work, and how continuing education after high school could fit into your financial future. Better Money Habits – Education can be a crucial, but expensive part of your future. Discover how to make paying for school more manageable. Reality U – Helps students understand some of the “realities” involved in preparing for an employable future and adulthood as they learn about income, debt, credit, and the cost of raising a family. Next Generation Personal Finance – offers a free online curriculum of 65+ complete lessons and 200+ standalone activities you can access from anywhere. Hands On Banking – Learn how to manage your money responsibly, use credit, protect your finances, and reach your financial goals. Hands on Banking – Financial information for service members. Create a spending plan, learn how to establish credit, and prepare financially for PCS and deployment. Association of Military Banks of America (AMBA) is a not-for-profit association of banks operating on military installations, banks not located on military installations but serving military customers, and military banking facilities designated by the U.S. Treasury. CFPB Office of Servicemember Affairs provides information for servicemembers. Military.Consumer.gov is the site for the Federal Trade Commission’s Military Consumer campaign. Federal Reserve Bank of KC Small Business Resources – We support community economic development by providing information, research and resources for economic developers and small business owners. BBB Institute for Marketplace Trust– Its mission is to advance trust in the marketplace through programs that promote best practices and business ethics, raise consumer awareness and training about scams, fraud, and deceptive advertising, and build financial and digital literacy. The Institute offers in-person and online training, print and digital educational resources, scholarships and programs. The Small Business Administration (SBA) administers the Small Business Development Centers program to provide management assistance to current and prospective small business owners. The Association for Enterprise Opportunity is a national association of organizations committed to microenterprise development and maintains a clearinghouse of microenterprise development programs. The Microfinance Gateway is a public forum for the microfinance industry at large that offers a wealth of tailored services for microfinance professionals, including resource centers on specific topics in microfinance, a searchable library of electronic documents, a consultant database, a new bulletin board, and specialized discussion groups. The Gateway’s resources constitute a comprehensive source of information on microfinance on the World Wide Web, featuring 3900 online documents and over 900 listings of microfinance institutions (MFIs). 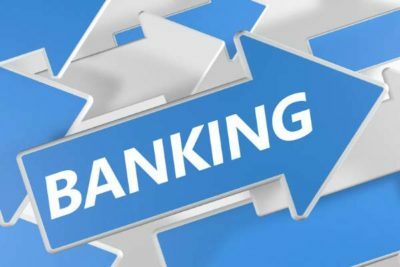 Hands on Banking – Financial information for entrepreneurs. Find tools and information to help you start, manage, and grow a business. Credit Abuse Resistance Education Program (C.A.R.E) This program is a one-hour, interactive presentation by judges and lawyers focusing on the proper use of credit cards, the cost of credit, the effects of credit card use, and the economic and personal effects of credit card abuse. It was developed to educate young people, mainly high school juniors and seniors, about the hazards and pitfalls of credit card use and abuse. To arrange a presentation, please contact the U.S. Bankruptcy Courts at 816-512-1883 (Missouri) or 913-735-2110 (Kansas) or contact Kerry Brown at Kerry_Brown@mow.uscourts.gov. Council for Economic Education offers both online and in-person professional development opportunities for educators throughout the country. To find in-person workshops in your area, please visit our Activities by State page, where you can find the website and contact information for the CEE affiliate closest to you. Federal Reserve Bank of Kansas City – Teacher workshops are available every summer and webinars are offered year-round on a variety of topics. Both are free to K-16 educators and education professionals and feature hot topics tied to economics and personal finance. Kansas Council for Economic Education – Resources to equip Kansas teachers to educate Kansas students (K-12) on the principles of economics and personal finance. Kansas State Department of Education – Kansas classroom educators can learn about certification procedures and requirements. Missouri Department of Elementary and Secondary Education – Missouri classroom educators can learn about certification procedures and requirements and professional development opportunities in their region. Teacher Online Resource Center – The Federal Deposit Insurance Corporation (FDIC) and the Consumer Financial Protection Bureau (CFPB) are working together to make it easier for schools to bring financial education into the classroom by developing a one-stop-shop for educators. 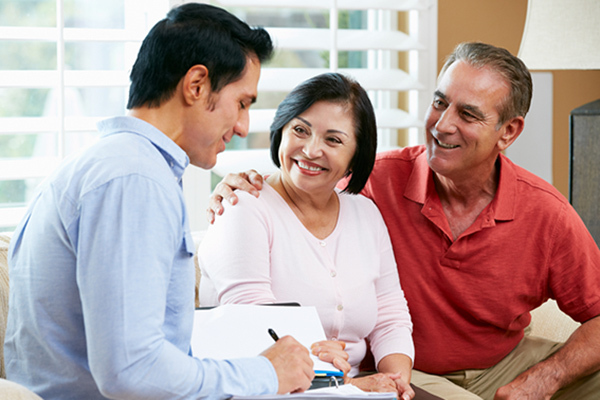 NEFE offers free resources for those who teach financial education skills to underserved audiences through financial planning, social services, community organizations, volunteerism and human resource-related tools. The State of Personal Finance Education Across the Nation – View a map detailing how personal finance is integrated within the school systems throughout the United States. School of Economics – Programs specific for Grades 2nd-3rd and 4th-6th. The following list highlights K-12 curricula that aligns to content standards and is designed to promote financial understanding in young people. The curricula address the concepts of budgeting, credit, saving, investing and more through hands-on classroom-ready lessons and activities. FDIC’s Money Smart Financial Education Program – Features four free age-appropriate curriculums that are designed to promote financial understanding in young people. EconEdLink – Links to lessons, interactive tools, professional development opportunities and student financial literacy competitions across the country. Federal Reserve Education – Equips educators, educates students and empowers consumers through lesson plans, games, activities, online courses, multimedia-based tools and more, searchable by grade range, topic, correlation to national content standards and format. Features over 250 free resources tied to personal finance concepts. Jump$tart Coalition – Showcases an online library of financial education resources for teachers, parents, caregivers and anyone committed to financial smarts for students. Missouri Council on Economic Education – Provides access to free classroom lessons on earning income, buying goods and services, saving, using credit and financial investing. Money As You Learn – Offers educators texts, lessons, and tasks that connect the Common Core to real life applications while also equipping students with the knowledge needed to make smart financial decisions. Money Math: Lessons for Life – Features a four-lesson curriculum supplement for middle school math classes using real-life examples in personal finance. Next Gen Personal Finance – Next Gen Personal Finance offers a free online curriculum of 65+ complete lessons and 100+ standalone activities you can access from anywhere. Preview lessons and activities and easily access them on the Gooru platform. Practical Money Skills For Life – Helps consumers, educators, parents, policymakers and students of all ages learn the essentials of personal finance through articles, games and lesson plans. School of Economics – This section of the website is for teachers who have scheduled field trips to the School of Economics for the 2017-2018 academic year. It includes preparation checklists, forms needed for student businesses, information about volunteers, and links to financial education curriculum. Lead to Read – Connects trusted, caring adult volunteers with 1 – 4 grade kids in urban schools for 30 minutes per week. Mad City Money – Gives youth a taste of the real world within a school setting as they experience a budget simulation activity. Metro Lutheran Ministry – Learn how we minister to our Kansas City area neighbors who are poor, elderly or disabled. Do you need a speaker on almost any financial education subject for youth, teens, adults, seniors, etc.? Request a speaker that will come to your school, organizations, church, etc. and present on the financial education subject that you choose.